MINNEAPOLIS (AP) — Karl-Anthony Towns scored a franchise-record 56 points and added 15 rebounds for his league-leading 63rd double-double, and the Minnesota Timberwolves beat the Atlanta Hawks 126-114 on Wednesday night. Towns was 6 of 8 from 3-point range and added four assists for Minnesota, which recovered after a disappointing loss Monday to the lowly Memphis Grizzlies and trailing last-place Atlanta throughout the first quarter. 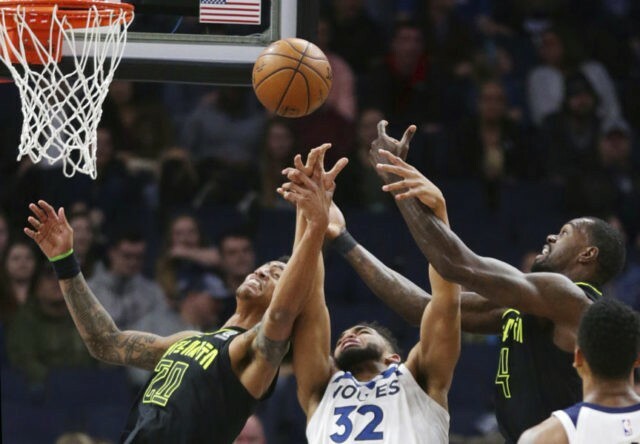 Andrew Wiggins added 17 points and Jeff Teague had 11 points and eight assists for the Timberwolves, who avoided a third straight loss by shooting 53.3 percent, including 13 of 30 from behind the arc. Minnesota (43-33) pulled into a tie with seventh-place Utah, which hosted Boston later Wednesday. Mike Muscala had a career-high 24 points off the bench for Atlanta, which stayed within striking distance of the Wolves by hitting 13 of 27 from 3. Dewayne Dedmon had 13 points and 12 rebounds for the Hawks. Atlanta has lost 10 of its past 11 games. Minnesota allowed Memphis to gain confidence early on in the upset on Monday and allowed Atlanta to do the same. The Hawks shot 61.1 percent in the first, hit five of their first seven 3s and led by as many as six points. Towns took control in the second as Minnesota used a 19-4 run to take a 12-point lead. Towns had 26 points in the first half. The Wolves stretched the lead to 16 in the second half, but the Hawks started to chip away in the fourth. Isaiah Taylor had nine points and Atlanta went on a 14-4 run to close within 110-104 on a 3 by Muscala. Towns missed five shots during the run. But he went back to work and finished with his first 50-point game and the fourth in team history. Hawks: Starting SG Damion Lee left the game with a dislocated pinkie finger on his right hand, according to the team’s Twitter account, but later returned. . PG Dennis Schroder missed his second straight game with a left ankle sprain. . Atlanta now has 835 3s this season, adding to its franchise record. The Hawks started the day 10th in the league in 3s per game. Timberwolves: PG Derrick Rose missed his fourth straight game with a sprained right ankle. C Cole Aldrich missed his second straight game with an illness. . All-Star Jimmy Butler took shots in practice and has been trying to work his way back from meniscus surgery on his right knee. Coach Tom Thibodeau said Butler still hasn’t been cleared for contact and there is no timetable for his return. . Tre Jones was named Mr. Basketball as the top prep player in Minnesota in an announcement during the third period. Jones, the brother of Wolves G Tyus Jones, is set to play at Duke next year, following in Tyus’ footsteps. . Minnesota has allowed its opponents to hit 53 3s over the past four games and at least 12 a game in five of the last six games. Hawks: Host Philadelphia on Friday. Timberwolves: At Dallas on Friday.